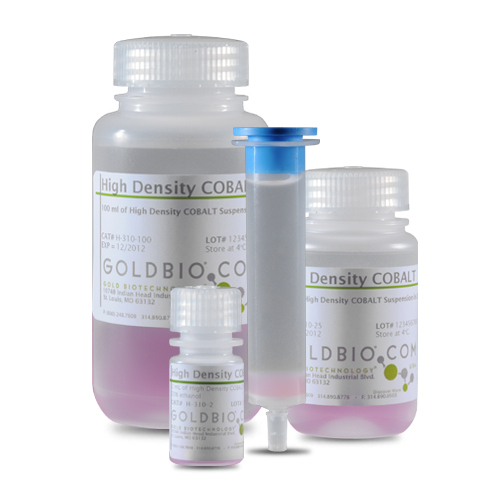 Available in bulk or in prepacked columns, cobalt has a binding capacity of >25 mg/ml with approximately 60 kDa protein. Cobalt binds fewer host protein contaminants, resulting in lower background than nickel resins and no metal contamination in eluted histidine-tagged protein sample. In addition, it allows for purification of proteins under native or denaturing conditions. Cobalt Agarose works very well with Ni/Cu/Co Resin Wash Buffer and Histidine Protein Elution Buffer. IDA cross-linked Agarose resin consists of iminodiacetic acid groups ligated by stable ether linkages via a spacer arm. IDA is a tridentate chelating agent, covalently coupled to cross-linked agarose beads. This resin is loaded with Co 2+. The resulting, ready-to-use resin is ideal for rapid purifications of His-tagged proteins. Affinity chromatography is based on the interaction between certain superficial protein residues (histidines, cysteines and to a lesser extent tryptophans), with transition metal cations, forming chelates.